For what it's worth, if anyone is interested, I finally got my new hulls from Jim Sohn, the new hulls weighed in at almost exactly 100# each. got my old ones (04's) sold, and the new ones beamed up. The rudder castings required a bit of filing to fit the new style gudgeons. They put some neoprene at the front and back of the top of the daggerboard trunk that needed to be removed and replaced with something that didn't cause the boards to stick when raising and lowering. Next step will be to get the tramp on and tight. Anyone else had their new hulls on the water yet ? If the grass is greener on the other side of the fence, maybe it is time to water your own lawn. Stephen, When you get it to the water please post some pictures so we others who are in love with the 18 can drool. Have all these new hull sets been sold? Check with Jay at Backyard Boats. He may still have a set left. I know Jim Sohn has at least one set in Des Moines, Iowa left. Are any of these hulls still available? Neighbor's deck floated off during Hurricane Harvey and sunk my boat. Hull damage too severe to repair. Or any used hulls but well cared for and race ready? So sorry to hear that. This Hurricane season is really sucking. Unfortunately these hulls are long gone from Hobie Cat. Jim's sailing had a set 5 years ago. It will be interesting to know how Hobie handles the hull-design after 2024. On the other hand: there's a ton of used Tiger 18s out there; they are a more stable construction and available from 3500 and up ... but they ain't our beloved HC18s. I believe the hulls are well out of patent at this point, as my understanding is that a US patent only allows exclusivity for 20 years from the date the patent is awarded, and cannot be renewed. However, I think that's the least of the concerns with regard to producing replacement hulls. It seems that the cost to build a mold and produce hulls in a large enough quantity to be cost effective, while maintaining a decent build quality and consistency would be extremely challenging for anyone not in boat production full time. In short, if anyone could make it work and make it cost effective, you'd think it would be Hobie, who is already producing catamarans on a regular basis. Coupled with a nearly non-existent market for replacement hulls (at least at the price they would have to be), I don't think it would be a successful venture. 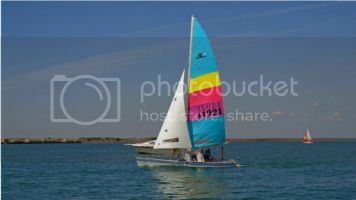 I think if Hobie offered complete boats again, rather than just replacement hulls, they would be considerably more successful, but I'm not sure if it would be enough to reinvigorate the fleet. I hate to be the nay-sayer, because I'd love to see someone bring back these boats, but unfortunately I think that's where it sits. I wonder if Hobie has even bothered to keep the original molds for the hulls. There aren't nearly as many Hobie Tigers available in the US market as there are in Europe, so that's less of an option here, and as I understand it, the Tiger is a very different boat. Parts are harder to come by and more expensive, and the boat handles much differently. There are a fair number of used H18's out there in the US, but the number of boats in good condition seems to be quickly dwindling. I'll certainly preserve my boat as long as I can, because I don't think there's another Catamaran out there that offers nearly as much as the H18. The last run of Hobie 18 hulls came from our Australian factory. Not sure if they still have molds, but that exercise was not successful. We will not do it again. The cost is just too high to fix up an old rig. Better off buying a current production model of some kind. If we started building 18s again... just a guess, but if we did some volume in sales / production they would be $18,000 or so. We don't have that volume is sales to even order the aluminum and special parts at this point. There is no patent on the hulls. Never was. that exercise was not successful. We will not do it again. The cost is just too high to fix up an old rig. Better off buying a current production model of some kind. If we started building 18s again... just a guess, but if we did some volume in sales / production they would be $18,000 or so. We don't have that volume is sales to even order the aluminum and special parts at this point. Thanks Matt, that's about what I thought/understood about the economics of building new/replacement H18's. I understand that the economics just aren't there, but that doesn't mean we have to like it! It's a shame that beach cats have become such a niche market, and so splintered with all the different boats out there. It seems that everyone wants something just a little bit different out of their boat, kinda like the automotive industry... but the volume of sales just isn't there to support it. But then, look at the America's Cup. There's just a handful of yacht clubs that compete regularly, and even they can't decide what they want in a boat! Emirates Team New Zealand and Luna Rossa Challenge have already decided that it's out with the foiling cats, and in with foiling monohulls!